Perfect Page have been providing web development services and copywriting services to businesses since 1995. Boasting a talented team of website design specialists, Perfect Page have created many responsive and e-commerce websites for clients in Surrey. With over 20 years’ experience in offering web design solutions and SEO expertise to SME’s in Weybridge, Guildford, Woking and other areas of Surrey, Perfect Page will work closely with clients during the web development process to create new sites or enhance existing sites to high standards. Perfect Page’s web developers and copywriters help clients to improve their rankings through search engine optimisation and enhance their web content to increase traffic. From therapists to hairdressers and construction companies to hotels, Perfect Page have worked for a vast range of clients to produce effective websites. Whether you are looking for a WordPress site, CMS website or bespoke web design service, Perfect Page are an established website provider that can help support your business needs. Perfect Page also give people the opportunity to sell Surrey web design businesses to them, they will pay a fair price for your web design company and ensure that your existing clients are well looked after with their Weybridge website design support team. 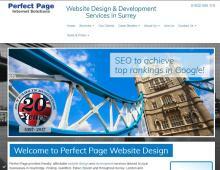 If you are based in Surrey and are looking to sell your web design company, contact Perfect Page for an informal discussion.